Nativity Christmas German Pyramid has Mary and Joseph and Baby Jesus under an arch with a shaved wooden tree at the center. 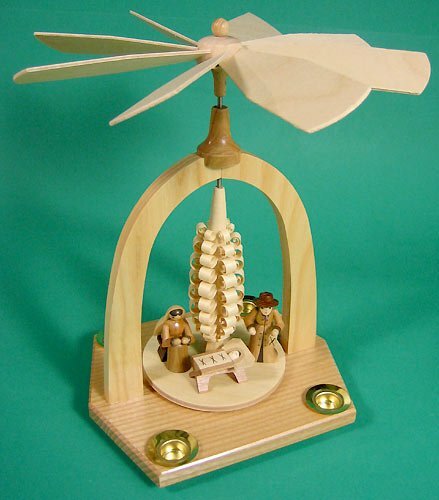 Nativity Christmas German Pyramid stands about 9 inches tall and uses 4 medium candles to turn the Christmas Carousel. Made in the Erzgebirge Mountains of Seiffen Germany. Your family and children will always remember the joy that German Pyramids brought to the Holidays. When they see the German Pyramid, they will remember you.